I'm sooooo glad it's Friday! This was the first week back to school and it's been a long one! I think the first stamp set that I liked when I got the new catty was Nature's Nest. So this is the first card I made with it. I had some samples of the core-dimensions cardstock that I ran through the Cuttlebug and then sanded. The turtle is just stamped with Handsome Hunter, then layered on the same and Choc. Chip. The card base is Sage Shadow. 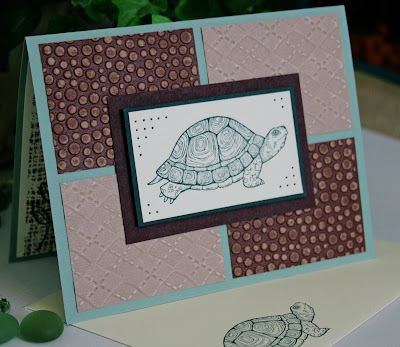 The embossed layers are PERFECT to use with your turtle! What a great card!